The garden at Oxnard's Rio Rosales Elementary School had been left untended for quite some time, but with donations and community support, students are now planting vegetables, fruits and flowers. The garden is a place where students can get excited about plants and nutrition says Leann Guzik the school’s library clerk who helped spearhead the new garden project. 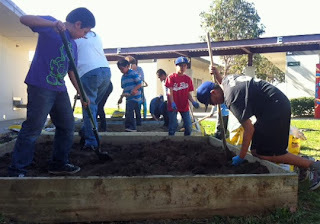 "With a school garden, with have the potential to impact our community's lifestyle," says Leann. "It is our hope that our garden can be a place to enrich the classroom lessons and allow students to experience learning from their own observations--all while munching on fresh vegetables picked from the garden!" 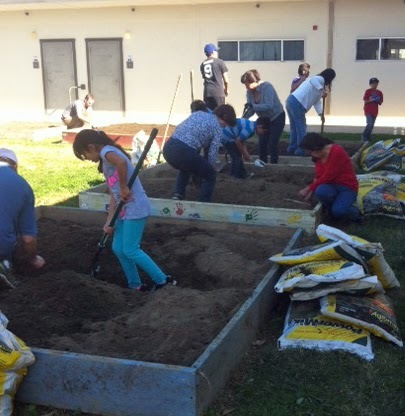 Agromin was happy to help out by providing the soil for the garden beds.